Frédérique Baron, an iREx Ph.D. candidate at the Université de Montréal, will submit her Ph.D. thesis in December 2018. 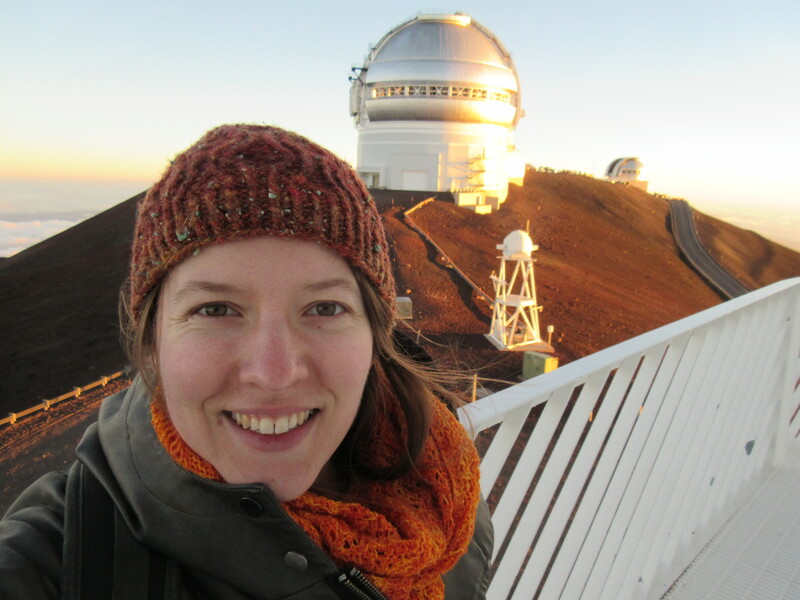 Here, she summarises the research projects she carried out during her Ph.D.
Frédérique at the top of Mauna Kea, in Hawaii. Credit: Frédérique Baron. The numerous exoplanets discovered in the last two decades show that exoplanets can be quite different from the planets in our Solar System. Direct imaging has enabled us to discover a class of giant planets which have orbits with a very large semi-major axis. Approximately 20 planets were discovered using this technique, and half of them have a wide separation, i.e. that their semi-major axis is larger than 100 AU. Giant planets on wide orbits are of interest for several reasons. 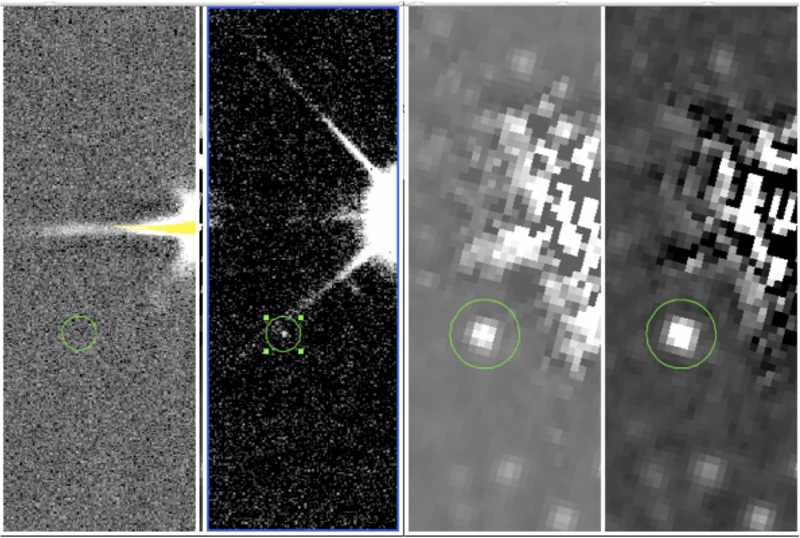 First, as they are far from their host star, they can be studied as if they were isolated objects without the need for sophisticated imaging and data analysis techniques. A high resolution spectrum can then be acquired to learn more about these objects. Second, because the planet and its host star were formed together, they share the same age and distance from Earth. It is thus very interesting to probe around stars for which these characteristic are well known, as these data are crucial to estimate the mass of the planet. Example of a planetary candidate around a young star. From left to right, we see an image at 0.9 micrometers (Gemini-S), at 1.2 micrometers (Gemini-S), at 3.6 micrometers (Spitzer) and at 4.5 micrometers (Spitzer). This candidate turned out to be a background object. Credit: Frédérique Baron. The works accomplished during my Ph.D. helps constrain the distribution of giant planets around young stars on very wide orbits and show that these objects are quite rare. I lead a projet aiming to discover planets around the 180 stars belonging to a young moving group within 70 pc of the Sun. The stars were observed using the Canada-France-Hawaii Teslecope, an observatory at the top of Mauna Kea in Hawaii, the Gemini-South telescope, an observatory at Cerro Pachón in Chile, and the Spitzer Space Telescope. This survey was then included in a meta-analysis of other direct imaging surveys with the goal to put constraint on the distribution of giant planets on wide orbits. The meta-study showed that the frequency of giant planets on wide orbits is low. This low frequency could be a clue, telling us that these companions may have formed in the same manner as brown dwarfs, by fragmentation of the molecular clouds, instead of like giant planets, formed in a protoplanetary disk. Frédérique Baron did her PhD at Université de Montréal between 20124 and 2018, after completing an MSc, also at Université de Montréal in 2014. Her MSc and PhD advisor was David Lafrenière.